The Chesprocott Health District is dedicated to helping you and your family prepare for and respond to emergencies that could affect the public’s health. Your Town will take the lead role, with Chesprocott assisting as needed, in the event an emergency shelter or other emergency services are needed due to a weather event, power outage, etc. Chesprocott will take the lead in the event of a public health emergency. Chesprocott has developed a Mass Dispensing Plan for the purpose of mass distribution of medications and/or vaccinations in response to a public health threat such as a disease outbreak or biological, chemical, or radiological hazard. 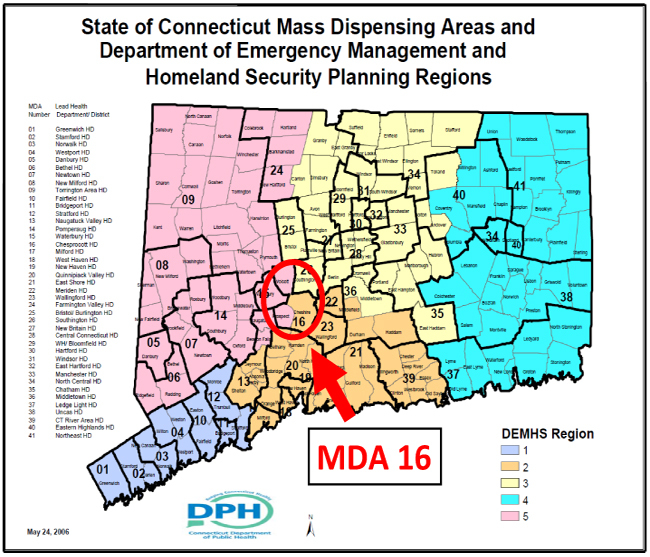 The Chesprocott Health District is designated as Connecticut Mass Dispensing Area 16 (MDA 16) which covers the towns of Cheshire, Prospect and Wolcott. Our goal is to provide you with quick, accurate information and give you direction and guidance should the need arise for mass dispensing to our residents. Point of Dispensing locations have been identified in our community should a public health emergency arise and medication and/or vaccinations are needed. For emergency preparedness and response information directly from the Centers for Disease Control and Prevention (CDC), please take a few moments to visit the CDC’s website here. We also encourage you to watch the following video clips to acquaint yourself with information related to the CDC, the Strategic National Stockpile (SNS), public health emergency activities, and the response efforts associated with dispensing medical countermeasures (MCMs) to the public. In the event of a Public Health Emergency involving mass MCM dispensing, Chesprocott Health District would initiate similar operations and activities as depicted within these videos. 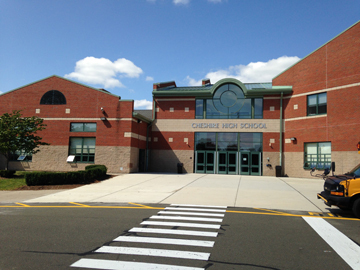 Cheshire High School located at 525 South Main Street, Cheshire, CT 06410 will serve all residents in the district (Cheshire, Prospect, and Wolcott). Volunteers are needed from all three towns to help during Point of Dispensing (POD) operations. Many skill sets, both medical and non-medical are needed to help the POD run smoothly. If you would like to become a Chesprocott Health District (CHD) Public Health Volunteer, you will need to register using CHD’s Volunteer Registration Form. Simply print out this form, complete it, and send it to CHD via fax, email, or regular mail. You are welcome to submit it in-person during normal business hours. After CHD receives your registration form, additional on-boarding information will be provided to you regarding volunteer training, scheduled drills and exercises, etc. To access CHD’s Volunteer Registration Form, please click here. It is essential that individuals take the time to prepare themselves and their families for a potential emergency before the emergency strikes. You can start living prepared by following these three basic steps. Taking time now to prepare can help keep you and your family safe in the event of an emergency. Start building your disaster supplies kit today. A disaster supplies kit is a collection of items you and your family may need in the event of an emergency. You may even have some of the items at home already. Your disaster supplies kit should include enough water (1 gallon/per person/per day), food, and supplies for you and your family for at least 72 hours. For information on items to include in your disaster supplies kit, click here. How will you communicate with your loved ones in an emergency? Where will you go if you have to be evacuated from your home? These are some questions you should address now, before an emergency happens. Sit down with your family and make a plan together, include the kids in this too. For information on making a plan, click here. Be informed about the different types of emergencies that could occur and how to stay safe during one. Knowing what to do before, during, and after an emergency is a critical part of being prepared and may make all the difference when seconds count.